Waiting on Wednesday is a weekly meme hosted by Jill at Breaking The Spine. It features each blogger's most anticipated reads. 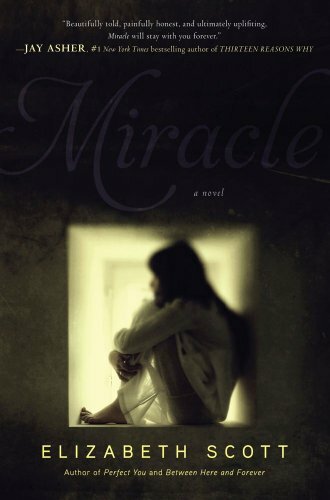 This week, my pick is Miracle by Elizabeth Scott. seems unable—or maybe unwilling—to see her as anything but Miracle Megan. Except for Joe, the beautiful boy next door with a tragic past and secrets of his own... All Megan wants is for her life to get back to normal, but the harder she tries to live up to everyone’s expectations, the worse she feels. This time, she may be falling too fast to be saved…"
Why I Can't Wait: Okay, anyone who knows me knows I'm a HUGE Elizabeth Scott fan. She writes some of my favorite contemporary books, and I just adore her. Secondly, did you see who was quoted on the cover? JAY ASHER!!! Ahh, love him too! Le sigh. The cover looks amazing (haunting, yet beautiful), and the summary sound even better. I WANT THIS ONE BAAAAAAD! Oh! I haven't seen this one yet! Aww look at you all fangirly lol. I hope you love it! A really haunting cover - very different from her usual cute ones. Sounds good too. Just the author and the author who blurbed this book would make me want to read it...and it sounds fantastic! I haven't seen this book before. Elizabeth Scott is an author I go to when I am looking for a short, light read. She isn't one of my favorites, but when I need a break, that is what I read! AHHHH!!! Love Elizabeth Scott :D :D :D Totally can't wait for this one!